Elegant and stylish, our Provencal, Victorian and Barcelona designs create a classic feel. Our Provencal kitchens have raised and fielded panels, which can be finished with a stop chamfer detail. 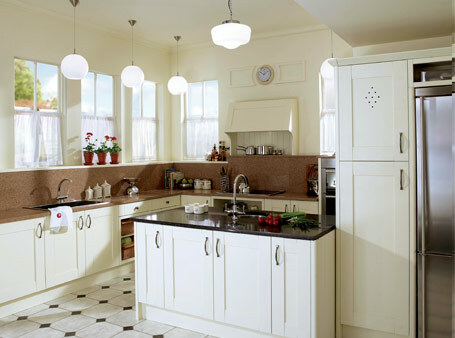 The Victorian kitchen is well suited to traditional period properties or for those who simply like more detailed design. Our Barcelona kitchen design has Art Deco styling, strong, geometric lines and Mondrian influenced leaded glass panels. All of these kitchen designs are available with either in-frame or concealed hinges and in a wide selection of natural hardwoods and hand painted finishes. < Barcelona: American black walnut and maple furniture with glass worktop.